Dried Flowers are 100% natural dried and processed products from local Dutch grounds. Dutch Dried Flowers are sowed in spring and after the growing period they will be harvested in summer. The flower is harvested when the natural flower is glorious. Harvesting Dried Flowers requires a lot of hand craft. Some flower products like Helicrysum and Delphinium are still cut piece by piece and by hand with knifes from the field. Others such as Acroclinium and Lavender are harvested with a sickle. This highlights once again the natural; handcrafted rustic character of our products. After the harvest the flowers are dried in our drying rooms. In 1982 Lamboo Dried & Deco started flower production of dried flowers. In the course of time we have developed a unique drying process. This process still guarantees us the best colouring and quality preservation today. With more than 35 years of experience, we are experts in the production of dried flowers. Not all flowers are suitable for drying, around 35 flowers can be used for drying. 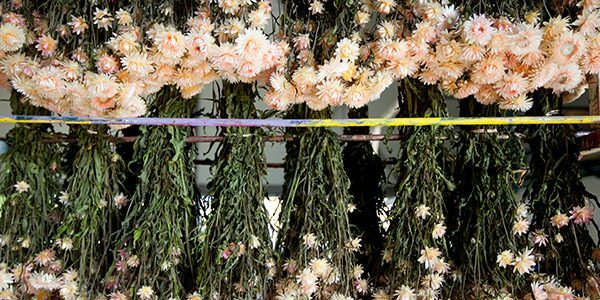 The bunches of flowers are then hung upside down on racks to be ready to go in our drying room. Flowers exist mainly of water. In the drying rooms the humidity will vaporise, the beauty captured and after that the Dried Flower is ready for packing. 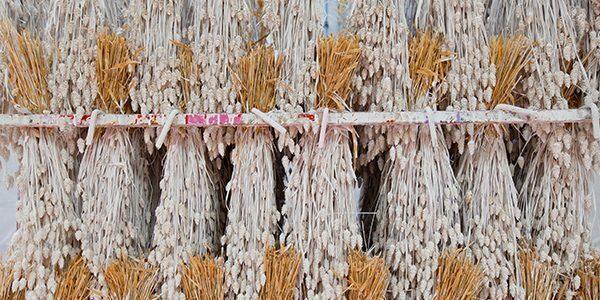 The growing interest of people for natural, rustic and hand-crafted products contribute to a high demand for Dried Flowers. Dried Flowers thank their reputation to their durability, and can last for months or even years, so it’s a very versatile product. With a 100% natural product, this makes a unique range. Also, from an ecological / sustainability view, Dried Flowers are more efficient than fresh cut flowers, due to their long shelf life and low energy transport and storage. The result is that dried flowers will have a significantly lower carbon footprint than fresh- cut and artificial flowers. Check out complete dried flower collection and possibilities in our catalogues. In addition, we invite you to visit our showroom. Besides Dried Flowers we offer a wide range of other natural decorations. It is also possible to provide certain Dried Flowers of a colour by means of special paints, this makes the life of the product significantly extended. Dyeing allows us to provide you continuously with trendy and seasonal colours. For example, Triticum with colours for spring, or colours and glitters for Christmas. All materials (dyes) used are certified and our wastewater is cleaned by our own water purification plant. In cause of environment we are also working on the development of bio-degradable glitters. All year around you can order Dried Flowers. Every year flowers are harvested during summer. 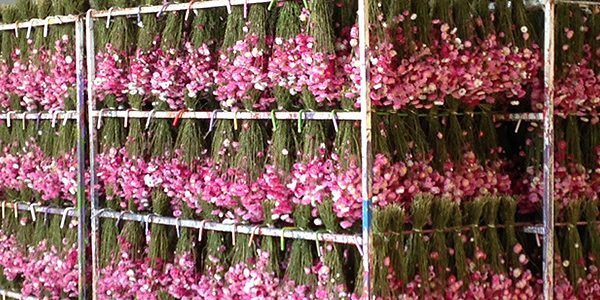 These flowers are dried at our company and available all year round, as long as stock lasts. For a complete overview of our range you are most welcome to visit our company (4.600 m2) and showroom (250 m2). Here you can also see that besides Dried Flowers we offer a collection of other natural (dried) decoration materials, among which picks for bouquets, decorative branches and potpourris.